Aloha, it's 88 degrees here on the island and I decided to make Vegetarian Chili by Joanne Chang....go figure. Since I don't eat meat, I've never had real chili which made this a little challenging. The recipe was easy and tasted good. My friends loved it and couldn't believe it was vegan. 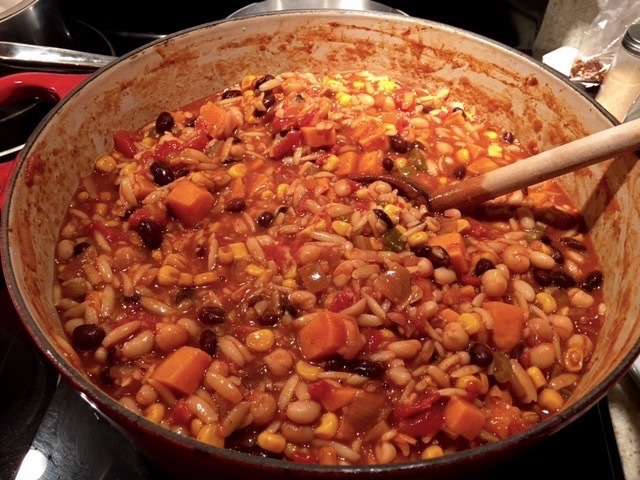 It contained a boatload of ingredients, 3 different types of beans, sweet potato, corn, celery, tomatoes, I threw in some orzo, onions, and garlic. The spices were the usual, cayenne, chili powder, cocoa, pepper, salt, brown sugar. I would like to know where everyone orders their spices from. CI did a review of Chili Powder and the winner was Morton and Bassett....I am interested to find the best Smoked Paprika, I used what I had on hand, Sweet Paprika from Penzey's...and who makes the best cayenne pepper? Thanks for your help, I believe using great spices are key to any recipe. Mahalo and thanks for letting me share. Well, the classic chili powder for chili is Gephardt's (from Texas). Personally, I use an ancho chili powder from Butte Creek Mill; I'm not sure what their source is. If you're really slow cooking, you can also used whole dried peppers instead of powder. Mahalo Fuzzy...I ordered some spices from the Spice House....great customer service. Lu, Because of some recent health issues, I am having to change my diet. I found this chili recipe while trying to research vegan recipes here. Made it last night and it was a great hit. Thank you for your recommendation. And if you have any other recipes to suggest, I would love them! Where did you find the recipe? In her cookbook? My web search came up with everything else but this. I would like to try it too! TIA. A Greenbrier County Schools initiative. If using dried beans, place them together in a bowl or other container, add 2 ½ qt water, cover, and refrigerate overnight. The next day, drain and rinse the beans. In a large sauce-pan, bring the beans and 2 ½ qt fresh water to a boil over high heat. Reduce the heat to medium-low and simmer for 1-1 ½ hours, or until the beans are tender. Remove from heat and drain the beans, save the cooking liquid for later. (Draining the beans will help them cool down.) Set the beans and liquid aside separately. If using canned beans, drain, rinse under cold running water, and set aside. In the stockpot, heat the vegetable oil over medium heat. Add the onion, carrot, celery, sweet potato, and garlic and cook, stirring occasionally over medium heat for 6-8 minutes, or until the vegetables start to soften (the onion will start to turn translucent, and you’ll be able to smell the vegetables cooking). Add the drained beans, corn, green chiles, tomatoes, and 4 cups of the bean cooking liquid, or water if you have used canned beans. Bring the chili to a simmer over medium-high heat. While waiting for the chili to simmer, in a bowl, mix the vinegar, brown sugar, chili powder, paprika, cocoa powder, cayenne, salt, and black pepper. Add this mixture into the simmering chili, mix well and bring back to a simmer. Reduce the heat to a medium-low and simmer for 45-60 minutes, or until the chili thickens a bit and the vegetables are tender. The chili can be ladled into bowls and served immediately, or it can be cooled, covered, and refrigerated overnight to develop flavor and texture. It can also be stored in an airtight container in the fridge for up to 5 days or in the freezer. **For an alternative, try adding rice: add ½ cup uncooked rice and an additional 1 cup of water during step 4, after 15 minutes of simmering. My favorite soiurce for chili powder is Pendery's. They have many pure chili powders, which I prefer to those with garlic and cumin, since I like fresh garlic, and like to add the cumin separately, so I know how much is going in. Chamayo is a good chili powder, found in many places, since it is a common Numex variety. Cochise and rancho are good, dark varieties, which I often use in 1:3 proportions with the lighter types. Pecos Red and Texas Red Dog are my two favorites of the lighter ones - I haven't tried all of them, but I have tried at least half of their powders! They also sell mixes, as well as whole chiles. Despite the heat wave, I made this recipe last night. This is the best veggie chili I've tried. I used canned beans instead of soaking. It seems the real difference with this recipe is that you mix the vinegar, brown sugar, and spices together in a bowl and later add it to the veggies. I did not use any special brand of spices, only what I had in my cabinet. Reading the discussion about chili powder reminded me of trying to decide among them. Dave, I will bring your list with me the next time I go! On a recent ATK program I was enlightened to hear them recommend 'canned beans rather than the dried ones in the stores that are often old'. It makes a lot of sense. Similar to the idea that frozen vegs. are often superior to fresh since they are packed at their peak. Now what to do with a hundred bags of dried beans in my pantry? I have a bunch of legumes in my pantry, and I always end up with a half cup or so of various types in a bunch of mason jars, so every once in a while I go through and pull the oldest ones out, and make a dish with several similar beans/lentils together, to use them up. I use a lot of canned beans, as well, esp. black beans and garbanzos, though many of my favorites are not in cans.